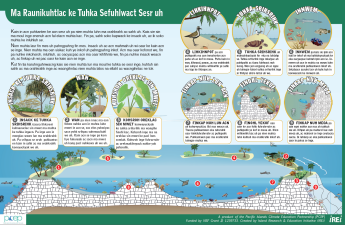 This highly visual poster displays information about high island environments with supporting text in Kosraean. Posters can be printed on letter size (8.5 x 11) or tabloid size (11 x 17) paper. This poster summarizes key concepts in the Our Low Island and Pacific Low Island Environment books. Need ideas for how to use these posters with your students? PCEP created accompanying poster activities for children, ages 5-13.